You know, Dad likes to fish anytime, not just on Father’s Day. However, the Father’s Day fishing trip always has us busy and this year is no exception. We had a great family on board and when asked what they would like to catch? Just put us on some fish was the answer… My favorite answer to this question. But today we struggled at first with this somewhat easy task. 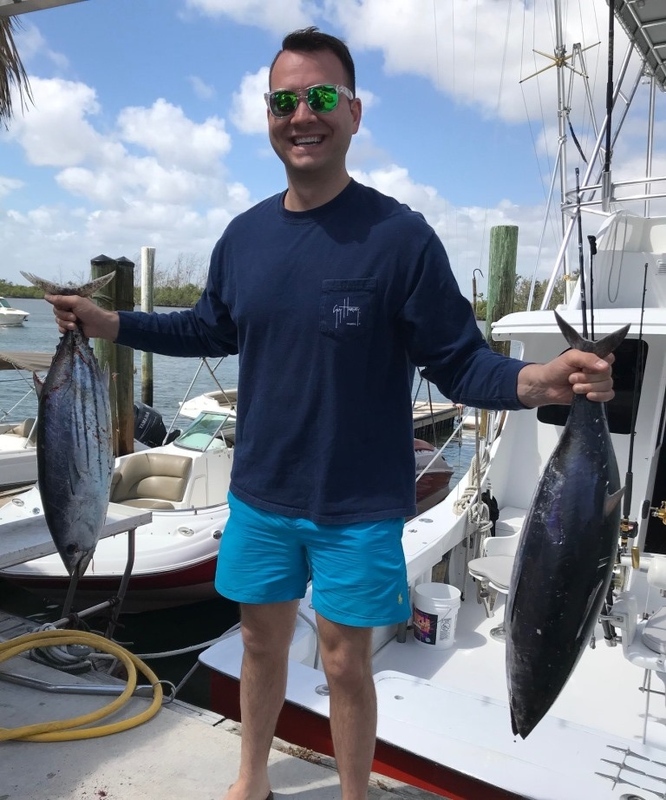 The radio for the fleet was reporting plenty of Kings and Bonito in the area. And yet, it had been over an hour of fishing and we still had nothing in our box. We’ve had the hits but missed every fish. It seemed an eternity before we finally stayed connected and just catching one King gave me hope our drought was over. Now some folks like Kingfish, others aren’t too fond of them. Our group could take or leave them so after boating 6 or so, we opted for some off shore Dolphin fishing. In order to catch Dolphin, you must find something to fish to. Plenty of seaweed has been around and with it being Father’s day, plenty of boats were out too. We got to the pretty blue water and began our search. Scattered grass and some big patches of weed were in our area. Little Bar Jacks that hide beneath the weed were also present. And finally, a Mahi! Easily too small to keep as was the second. But we continued and finally began catching some we could keep. No real big ones but the action was consistent as 1 after another made it into our box. They weren’t together, just coming one at a time. And being about 7 miles from shore, our time had come to go home. In the end, we had 6 Kings, 8 keeper Dolphin, we had released some 15 Jacks and probably almost as many small Mahis. But our group was quite pleased with the Father’s day fishing trip. With some changing weather and spring just around the corner, things are changing as the ocean warms. 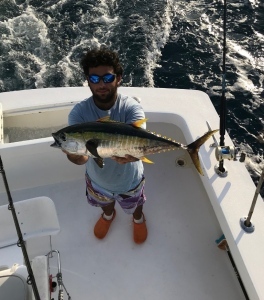 While some fish are still migrating south, others have started their return to the north and cooler waters. The next few months should make for some exciting fishing. Tuna, Wahoo and Dolphin should become more plentiful. Kingfish and Bonito should also show their presence in the reef area. But you’ll have to be on your game and get the fish into the boat quickly. Sharks will also be around and while have a fish is better than none? They usually eat the good half. 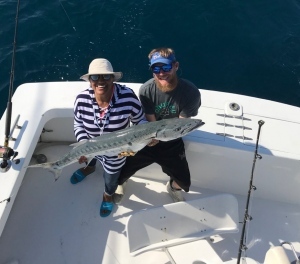 On our sport boat, we have been having excellent action on the wrecks and reefs with Barracuda and Amberjack. Mostly light tackle is being used with live bait for some great fights! 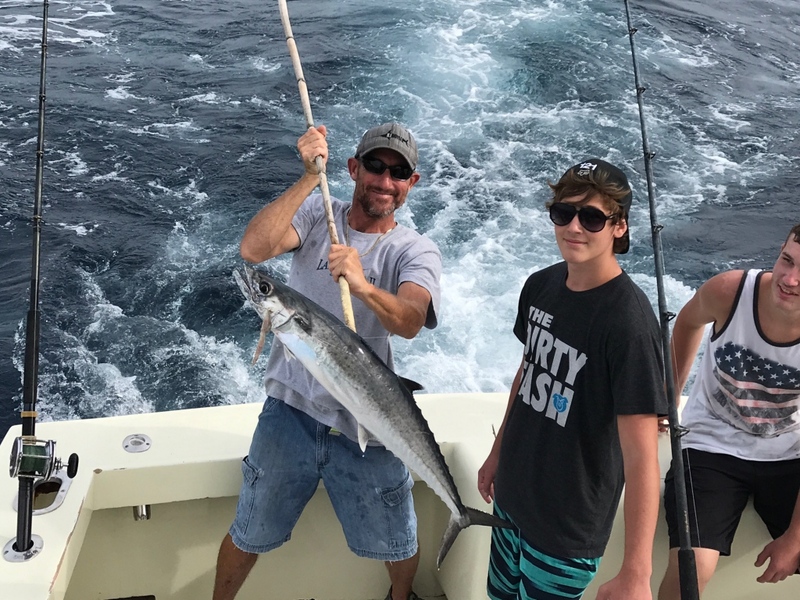 A few Kingfish and Wahoo are also being caught this way. You just never know. Our most recent Swordfish trip was a huge disappointment. Making 4 drops during the day netted one hook up and one miss. The hook up was a big fish and we fought it for almost an hour. We got the weight off and had the leader twice but this fish was not to be caught. His final run parted the main line. I’ve learned this is part of the game but absolute hate not seeing what we had on. Whatever you choose as far as fishing? Be it sport or drift, things are improving and fish are cooperating. Enjoy the day, keep the rod bent and you’ll be rewarded. Tight lines. 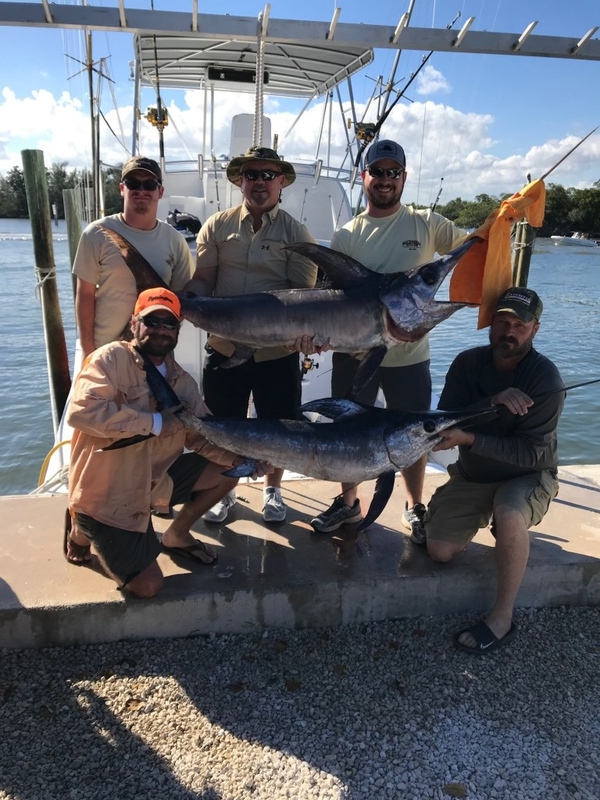 Our most recent daytime Swordfish fishing trip was a HUGE success! The word from the Swordfish grounds had been great for the last week or so. And it just so happened we have a trip booked just for that! Daytiming for Swordfish is highly specialized fishing. You’ll be between 1500 and 2000’ of water with a bait on or near the bottom. We use an electric reel for this. The main reason is… No one wants to wind up all that line and weight if you don’t get a bite and have to reset. Our guests are local and it turns out the money they paid for their trip with was some lucky money won at the local Casino, compliments of the Indians. So we loaded up early and were off to the grounds. Our boat make this trip in about 90 minutes from the dock. We did see a few things that looked promising on the way out but nothing panned out and our first drop got us a near instabite! The rod bent, the drag stalled and we were on! This fish was a small one but still legal and it seemed like the bite was still good as we boated the fish without the use of a gaff. 50” lower jaw fork length and into the box he goes! A quick run in the boat to get back to our previous position and the second drop of the day was on its way down. This time it took a bit longer to get a bite. We are tight again. This time it took 40 minutes before seeing this fish. He jumped about 150 yards from the boat and then again maybe 200’ from the boat. This fish was bigger with a 57”LJF and we used the dart and then the gaff to boat him. It’s only 11:30 and we have 2 in the box! All good things must come to an end. 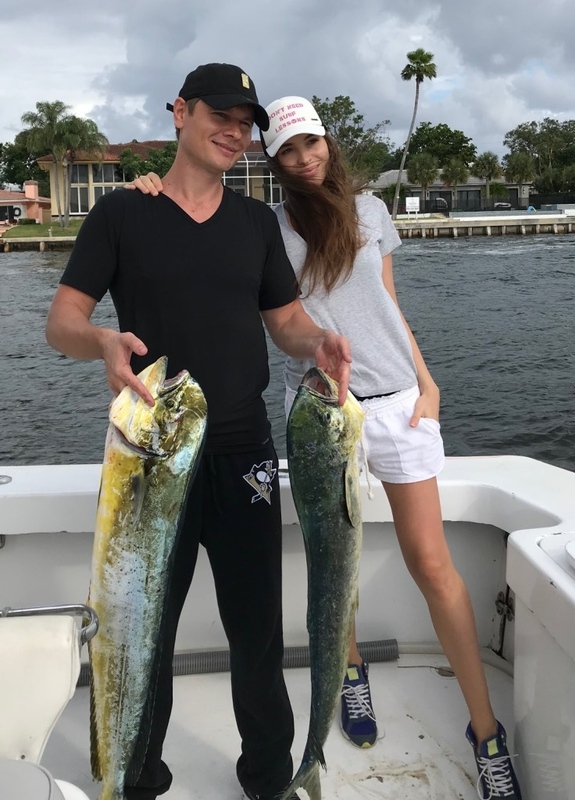 We again positioned ourselves in front of the fish and did get 2 more bites. But both came off around 800’ out. This was the story on the radio as well, bites but not staying hooked. None the less, our group was extremely happy with their bounty. Daytime Swordfish fishing isn’t exciting when you’re doing it, not till you get that bite… Wait, that’s ALL fishing. LOL It’s the excitement of that coming bite that keeps us coming back. Both our drift and sport fishing boats have been busy. We’ve been sailing and catching fish! Not always fast packed action but sizable fish on the sport boat as well as our drift boat. With the wind blowing for the next few days, fishing bottom on the drift boat will be tough. The boat moves across the area too quickly so only the most tenacious anglers will be rewarded. On the up side, drifting baits will be the best. 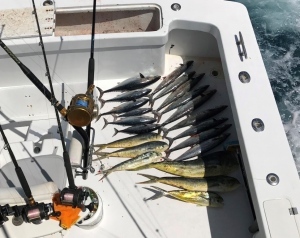 Kingfish, Bonito, Tuna and even an occasional Sailfish could be on the table for those who venture out. On the sport fishing boats, we have more control over the weather. Live bait has been the best with some fish too large for the light tackle we use. It’s not that you can’t catch a 200 or 300 lbs. shark on light tackle, it just takes some time. Like hours as in multiple. Light tackle is more suited for Sailfish, Barracuda, Wahoo and big Kings. 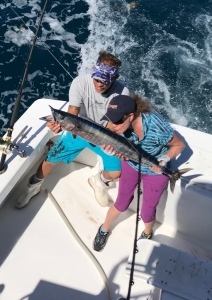 Trolling on the sport boats has had success with some smaller Sailfish, a few Kings and a Wahoo or two. But both the deep and shallow wrecks have been teaming with fish. Large Barracuda as seen in the pictures here and Amberjacks have been keeping our rods bent. And that occasional BIG bite that usually escapes has you thinking “What did I have on there”? One of the fish you might have had on could be this! We opted for heavier tackle to land this 9+’ Bull shark. And it still took an hour to get it boat side. 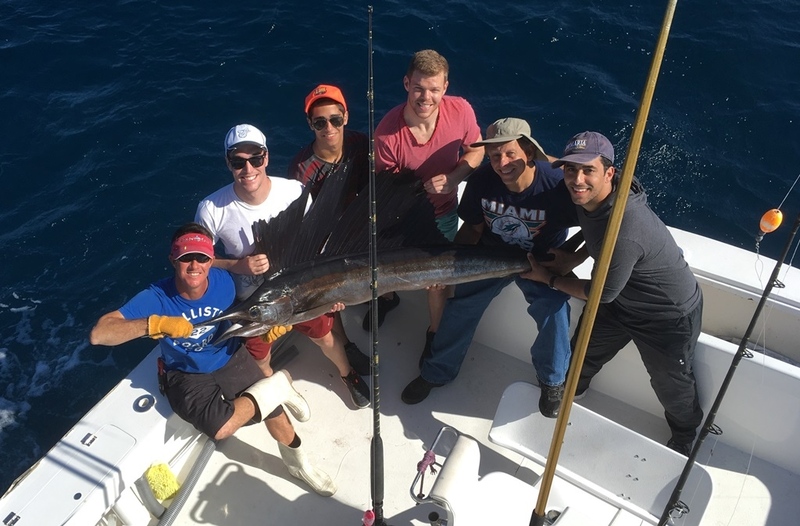 The afternoons have been better for Sailfish. There is a video clip on our Facebook page. While this fish was very acrobatic when we hooked him, by the time I got the video going, the touched leader was all I got. You can find he video at https://www.facebook.com/Fanntastic-Fishing-1476203306014764/ . That’s all for this week’s fishing. Hope to see you soon. With the week between Christmas and New Year behind us, we’ve found that one of our trips created a bit of a stir. 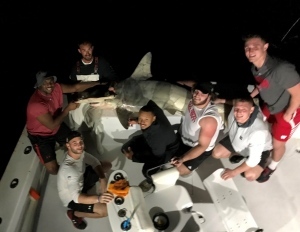 The Wisconsin Badger’s Hammerhead Shark is what we’ll call this. Sitting in deep water over 600’, we waited and I was about to try in shallower water when we got as bite. It was funny because we had the boys try and pull line off the reel. They had a tough time with where the drag was set. This fish did not have that problem and pulled off about 100 yards quickly. Our angler never faded and stayed set on his goal. It took a little over 30 minutes to see what we had caught, a 9’ Hammerhead shark. We boated the fish for measurement, tagging and pictures before releasing him. But that’s not what caused a stir. It seems at the game they posted a picture I had taken from the fly bridge of the shark and the crew on the Jumbo Tron. 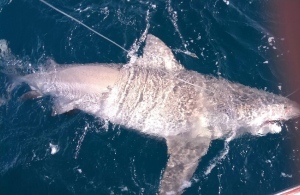 Hammerhead sharks are protected in state waters because they are endangered. The public and media were calling the FWC, our fish and game people. An agent contacted me some days later for an interview of what occurred. I explained we go to great lengths to take care of the game fish we catch and release. We have a hose that pumps sea water for our catches to breath and this helps us release them in good shape. When you see game fish caught on our boat in a picture, if it’s not edible, it is released. And it was the same with the Wisconsin Badger’s Hammerhead Shark. 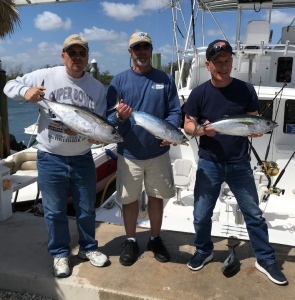 What a great past week it has been for our Sportfishing Charters here in Fort Lauderdale. 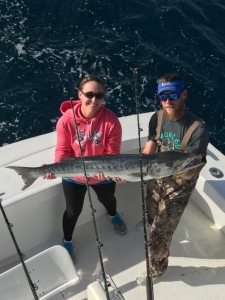 Not only is the weather absolutely beautiful with calm seas and sunny skies, but we are also experiencing some very rare catches right now including white marlin and some big wahoo. The morning have started out with a chill in the air and a very light breeze leaving the seas glassy. As we push away from the dock, we look forward to watch mother nature paints each day offshore. The picture is always different and the start of our winter season is officially under way. Clearing the Port Everglades inlet puts us about 2 miles away from the fishing grounds. 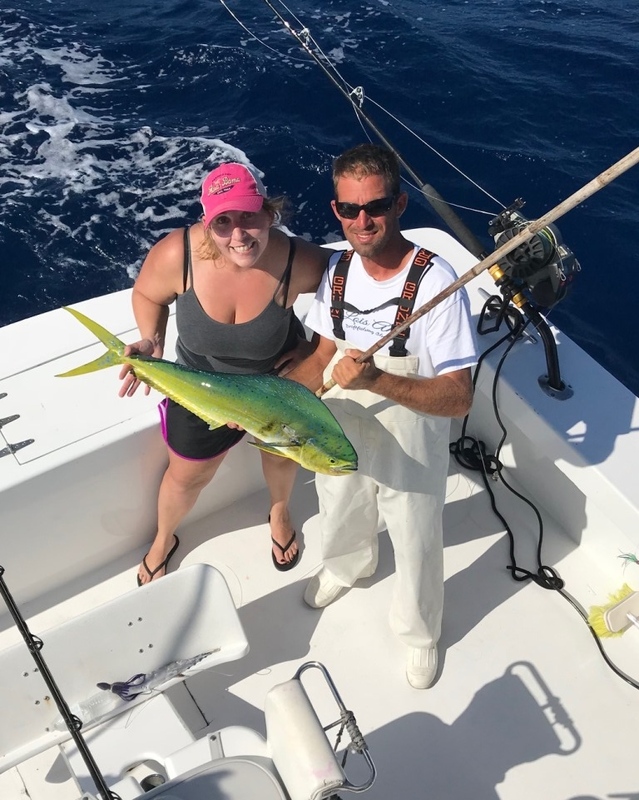 Did I mention we are the closest boat to the fishing in Fort Lauderdale? This gives our 4 hour trips much more fishing time than most of the fleet. As we break the 90 feet of water edge, we are looking for current, birds, weed lines, and debris to give away signs of fish in the area. It hasn’t been taking long until a school of ballyhoo or flying fish goes under the boat, letting us know there are gamefish nearby. 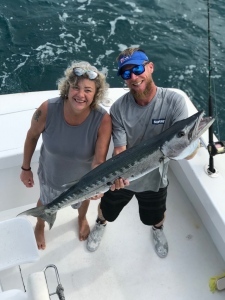 As my mate sets out the lines, we have been hooking up quickly on kingfish from 10 to 20 pounds along with a plentiful bonita bite which make great fights and even better bait for our monster shark charters. The limit on kingfish is 2 per person and with limits early in the am, I move on to deeper water to look for mahi. The past few days there has been a beautiful rip in about 400 feet of water with small terns feeding in the weed patches. From up in the tower I spot the mahi schools and ask our anglers to pitch live baits behind the boat. 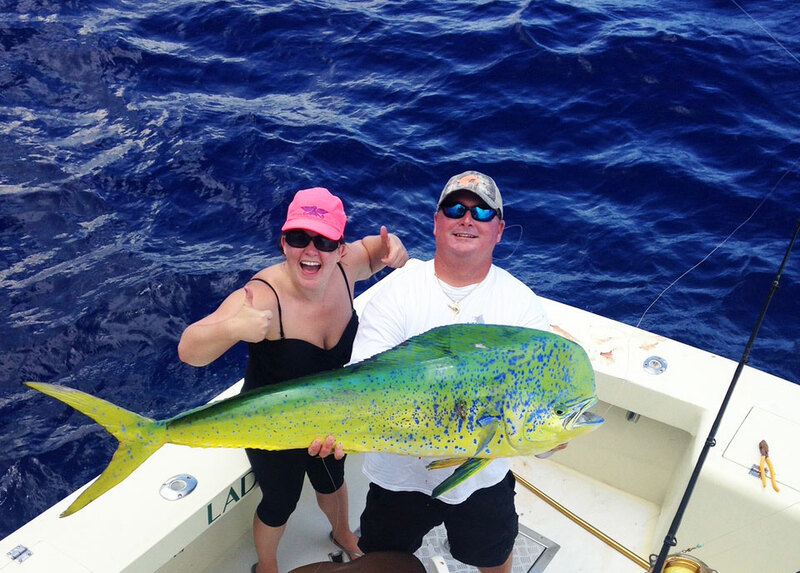 It wasn’t long before we loaded up on some nice 5 to 10 pound mahi. 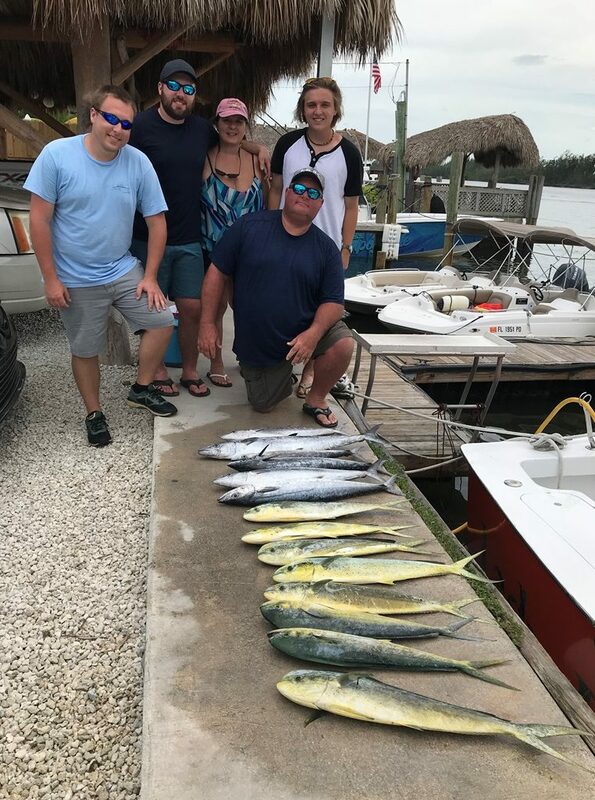 With a nice box of mahi and king mackerel, we still had about 2 hours left on our 6 hour sportfishing trip. I am hearing on the radio that there is a sailfish bite going on near the anchored cargo ships. These ships stay at anchor for weeks, even months on end and the bait fish congregate under them. It makes for great fishing and easy feeding for sailfish, white marlin, wahoo, jacks and much more! I didn’t have enough wind to get out the kites, so decided to troll around the ship using live baits that we caught earlier in the trip to see if anyone was home. It didn’t take long to get our first bite, but unfortunately the fish got off. About 20 minutes later we had another fish on and got a good hook into her for a nice catch and release. 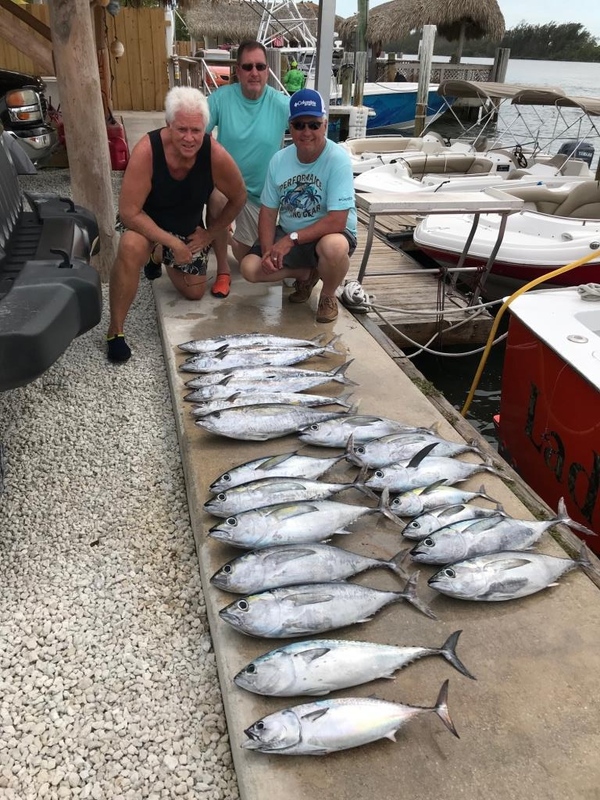 While not every trip can be as exciting as this one and there are no guarantees in fishing, we can guarantee that you will get an expert high level captain and mate that want to catch fish more than you do. We are passionate about putting you on fish and having fun while doing it. We still have dates open here in the 2017 as we wrap up the year and we are booking out the winter and spring season of 2018. We are also still running the $550 special for 4 hours, so please give us a call if you are ready to go fishing. But our Florida sun comes out and things get warm quickly. These cold snaps really help our fishing and keep things moving south. Just like many of you from up north. We’ll be seeing some of you soon. Our area here off the shore is like a virtual highway for fish migrating. Drops in sea temperatures have fish traveling for warmer waters. And just a few miles from shore everything from small to large will pass by. Sometimes they come in spurts of one species or another. Other times it can be like rush hour. 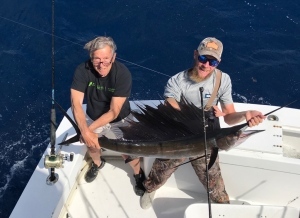 Sailfish are what we are expecting soon. They ride the waves and sea swells south against the current. It is known as “tailing” as they surf down sea on their travels south. It hasn’t happened just yet but will soon. Dolphin have been making appearances as well. While some sea weed helps, they too are just moving south and can be caught just out of the blue. Li8ve bait has been the best for these but trolling has also had good results. 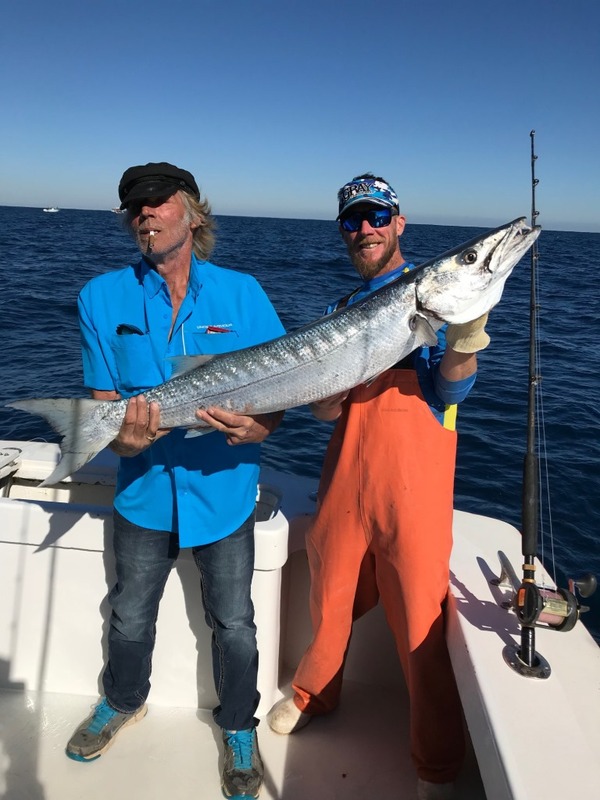 Our wrecks have been producing both bottom fish and some large predators as in the picture of Mike holding his monster Barracuda. Almost 30 minutes on light tackle to land this beast, a true trophy! We always try to provide our guests with what they hope to catch. But our main goal is to catch fish! And this “cool” weather has been helping our fishing this week.